saltwater at theatre works, coming really soon. Meet Jamie Lewis. Creator of Saltwater, opening at Theatre Works next month. Jamie is a performance maker originally from Singapore. A graduate of the LASALLE College of the Arts and the Victorian College of the Arts, Jamie creates and performs experimental and contemporary intercultural work. In 2012 she was a co-creator with Dan Koop & Co. on The Stream / The Boat / The Shore / The Bridge which received a Green Room Award for Outstanding Production – Creative Agency for Audiences. Saltwater invites you into an evening of storytelling, conversations and food. In a quick turnaround, Jamie finds herself married and migrated. To make things work, she channels the women in her life for answers. 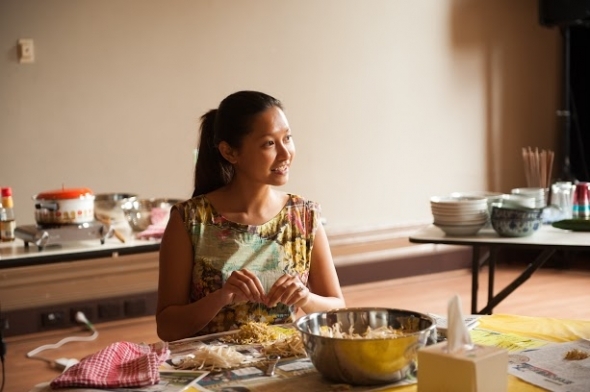 This is a live art experience that invites 15 strangers to share a meal and travel through memories of Singapore, childhood and lessons learnt.